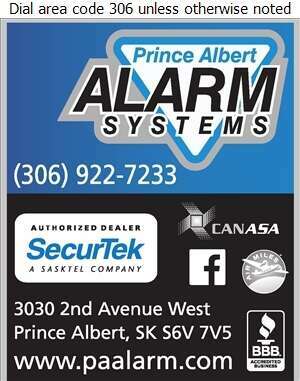 Prince Albert Alarm Systems Ltd provides customized security protection for homes, cabins, farms and businesses. Our professionally trained and criminal record checked staff will help you determine your security needs. When it comes to alarm systems, we consider the special needs of family members and pets, as well as budget limitations. Every property is of unique size and has vulnerable entry points, and we put together security, fire safety and environmental monitoring needs accordingly. We also install user friendly systems, and provide customer training at the time of installation. Proudly serving Prince Albert and District for over 10 years. Call us today for a free no pressure, no-obligation consultation.